Happy Black Friday! Or, in Inkblot’s case, black-and-white Friday. Though even that might be overstating things a bit. 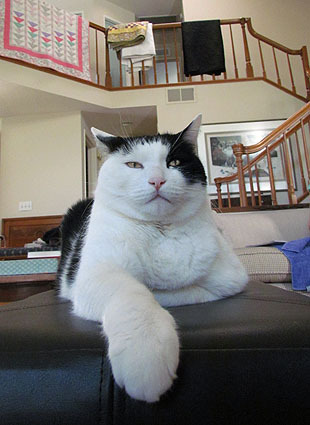 According to the five-year-old who joined us for dinner yesterday, Inkblot is now officially “the white cat.” You can see how he came to that conclusion compared to our other cat, but I’m not sure Inkblot was amused by the sudden youthful clamor that invaded the house last night. Domino, on the other hand, is so preternaturally calm that a bouncing, running, excitable five-year-old did nothing to ruffle her fur. She’s sort of amazing that way. In any case, there’s Inkblot on the left, obviously king of all he surveys. (This was pre-clamor.) 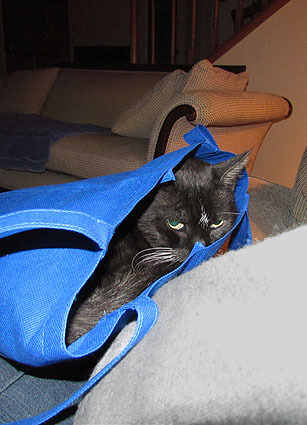 On the right, Domino is striking the ever popular cat-in-a-bag pose. She looks suspicious of the camera, and with good reason. It flashed at her, something it normally doesn’t do (we’re fans of natural light here in the Drum household). But it was dark and her face is completely black. What are you going to do?